Identification: This species has a translucent-brown body with diffuse white patches on top of the head and running along the midline of the notum. The cerata are brown basally with white tips. The central cerata are enlarged and coiled over the notum. The rhinophores have orange-brown tips and a white medial band while the cephalic tentacles are usually tipped in white. 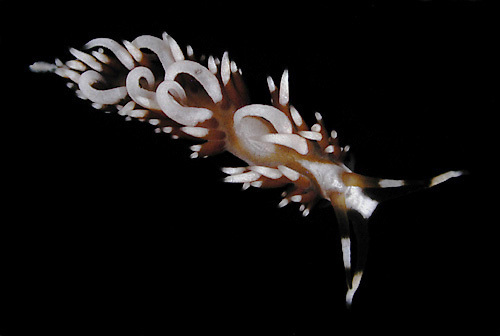 It can be distinguished from the similar appearing Phyllodesmium sp. #2 by the diffuse, rather than sharp, boundaries to its white patches and the orange-brown tips on its rhinophores. Natural history: Caloria sp. #2 is a moderately common species found in moderately protected to exposed rocky habitats and Halimeda kanaloana beds at depths of 4-9 m (13-30 ft). Rarely, it can be found in as little as 1 m (3 ft). It feeds on the introduced hydroid Pennaria disticha, shows a diurnal activity pattern in dishes and "flares" its central cerata when disturbed. Distribution: Maui and Oahu: widely distributed in the Indo-Pacific. Taxonomic notes: First recorded in Hawaii by PF from Molokini Islet, Maui in March, 1994. Photo: PF: 10 mm: Keoneoio, Maui; May 16, 1993.